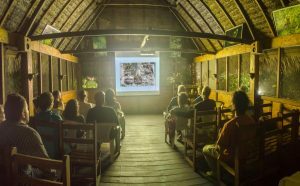 One of the highlights of this introduction to the Peruvian rainforest environment is the trip to Collpa El Gato. 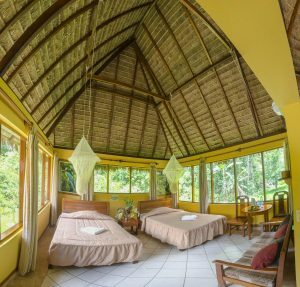 What makes this excursion unique is the opportunity it offers our guests to experience both a mammal clay lick and a macaw clay lick. 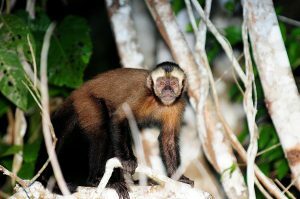 Many forest animals gather at these sites in search of the minerals essential to their diets, and during the walk through the forest we will have the chance to observe troops of monkeys and many species of birds. The mammal clay lick is often visited by White-lipped Peccaries, which are renowned for forming large groups, sometimes ranging from fifty to more than a hundred individuals. 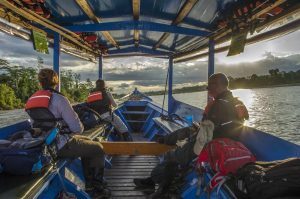 Following your morning flight to Puerto Maldonado from Lima or Cusco, you will be met at the airport by your naturalist guide and transferred to a dugout canoe for the trip up the Tambopata River to the lodge. On the journey the vegetation changes from colonized deforested areas to virgin rainforest. A box-lunch is provided on board. On arrival you’ll have a welcome drink and meet the rest of the staff. 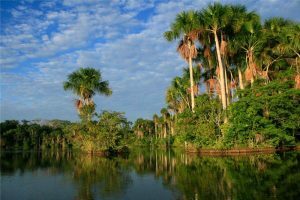 In the late afternoon you set off for an introductory walk into the “terra firma” forest behind the lodge (Trail 2), dominated by giant Brazil-nut and Dipteryx trees. Frequently seen mammals on this trail are Saddle-back Tamarinds, Brown Capuchins, Agoutis, Pacas, Blue-Morpho butterflies, Trogons, Toucans and many other species of birds. After dinner a night walk to find nocturnal animals or insects by their eye-shine, a specialization for increasing light and seeing better. 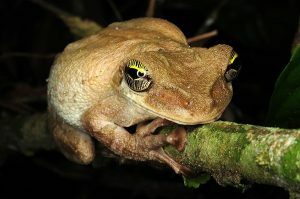 About 50% of the animals are nocturnal in the rainforest. After a six ‘o clock breakfast at the Lodge, we will board our launch for the 9-kilometer ride upriver to the trailhead. From the banks of the Tambopata it is a 1.7 kilometer hike to our destination. 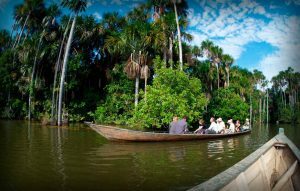 We will spend an hour walking this trail, with plenty of time to observe Amazon flora and fauna along the way. After about 800 meters, we will leave this trail and walk 300 meters through the forest to the mammal clay lick, or Collpa. Close to the wall of clay, we will await the arrival of the White-lipped Peccaries which tend to congregate in large groups to feed on the mineral deposits found here. After about 45 minutes, we will continue our walk to the nearby macaw clay lick, arriving at around 8:30 am. It is in the early morning that groups of Scarlet and Red-and-Green Macaws often gather to feed on the clay deposits essential to their diet, creating a colorful and noisy show. In the evening, we will venture out onto the river in search of nocturnal caiman, after meeting in the bar for a brief talk given by our guides about this fascinating nocturnal creature. 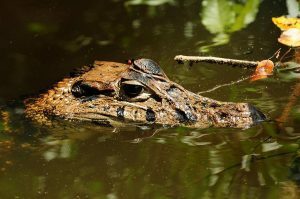 We will search for the caiman using flashlights to pick out their “eye shine” as they hunt along the river banks. Day 3: Hike to Lake Sachavacayoc (Tapir Lake). *All meals and accommodation from lunch on Day 1 to breakfast on your final day. *All transport from your arrival at Puerto Maldonado to your return to the airport. The remote location of our Ecolodge, 72 kilometers by river from the nearest settlement, deep in the forest and close to natural oxbow lake ecosystems, means that the most remarkable attractions of the South American rainforest can be reached easily in half-day or full-day excursions, while evenings can be spent relaxing and enjoying our hotel standard accommodation, restaurant and bar services. Our Suite rooms are spacious (34 m2 / 366 sq. feet) and fully screened against insects. Twin rooms are equipped with two double beds, double rooms with a king size bed. All beds are fitted with mosquito nets. Rooms have private adjoining bathrooms, with hot water provided by solar energy, and are supplied with bathrobes, slippers, cold drinks and a safe deposit box. Each room’s private porch (11.5 m2 / 124 sq. feet) is furnished with chairs, a table and hammocks. Our comfortable Superior rooms measure 24 m2 (258 sq. feet) and are fully screened. Twin rooms are equipped with two double beds, double rooms with a king size bed. All beds are fitted with mosquito nets. Rooms have private adjoining bathrooms, with hot water provided by solar energy. Each room’s private porch (10 m2 / 108 sq. feet) is furnished with chairs, a table and hammocks. 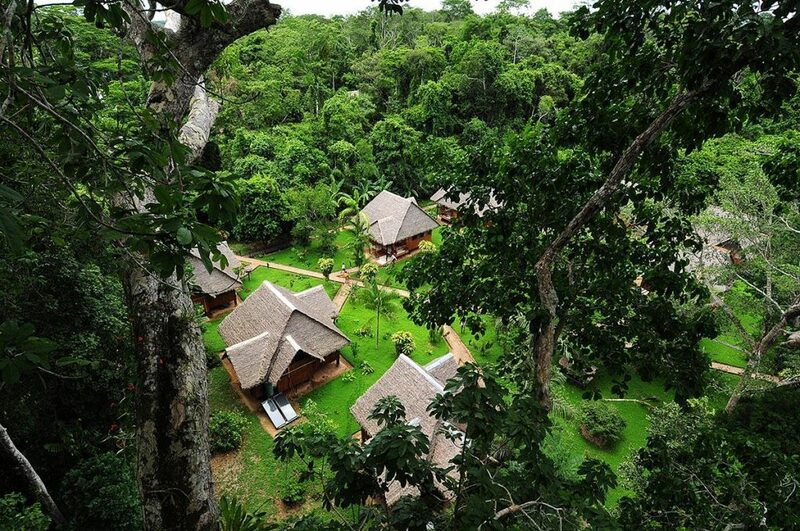 At the Ecolodge a visit to unspoiled tropical forest habitats does not mean enduring discomfort. We offer our guests the finest lodge accommodation in the reserve, with hotel-style comfort, infrastructure, facilities and food. The exteriors of our cabin-like rooms are designed from local materials to harmonize with their surroundings. 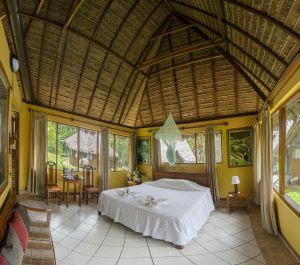 The Ecolodge’s interiors have been created with your comfort in mind, while many of the materials employed have been imported to the zone to minimize local environmental impact, while enhancing the luxurious feel of the accommodation. Rooms are spacious, well-decorated, comfortable and fully-screened against insects. 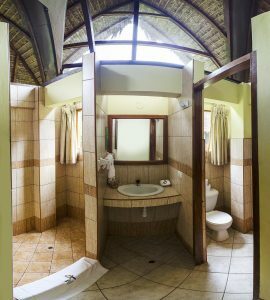 Our two categories of accommodation –Superior and Suite- have private bathrooms with light and hot water provided by solar panels, and each cabin has its own porch with hammocks for relaxing between trips into the surrounding forest. 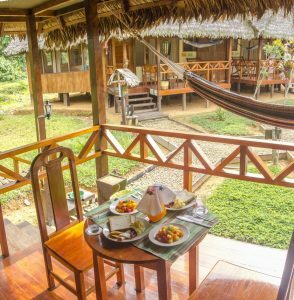 All meals and accommodation from arrival at the Ecolodge on day one of your itinerary to breakfast on the final day. All transport from your arrival at the town of Puerto Maldonado to your return to the local airport. All guided excursions described in the itinerary. 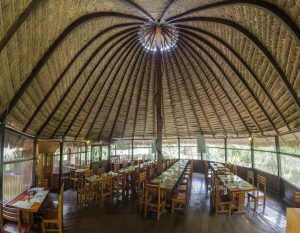 Flights to Puerto + entrance fee to Tambopata National Reserve (payable directly to the Reserve authorities); any drinks you may purchase from the Ecolodge bar; tips. For walks in the forest we recommend that you bring; light clothing, long loose-fitting trousers, long-sleeved shirts, a wide-brimmed hat and walking boots or tennis shoes. Around the lodge you can wear: shorts, T-shirts and sandals. The early mornings can be cold, especially when on the river; you should bring along a windbreaker or a sweater. Come prepared with an impermeable jacket or rain poncho, as heavy rain may fall at any moment. We have rain ponchos at the lodge but they can only be used on the lodge’s trails. You should also bring swimwear for bathing at Gallocunca and other forest streams. For excursions on the Ecolodge’s trail system, wellington boots are available in a selection of sizes for use by our guests. We recommend that you bring the following items: sun block, flashlight and batteries, a daypack, water bottle, medical kit, sunglasses, pocket knife, passport, waterproof bags, insect repellent. Please remember that we provide secure luggage storage facilities at our offices in Puerto Maldonado. 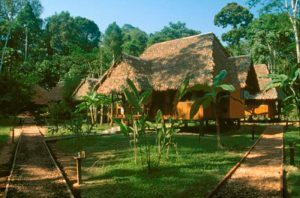 Tambopata Ecolodge requires guests to leave their non-essential luggage in town before setting off for the Ecolodge. Thanks to this measure, guests can travel on to the Ecolodge in our boat much more comfortably, taking only what they will need during their stay. We supply all guests with a duffle bag for this purpose at our offices. All our guests need to do is make sure they arrive in Puerto Maldonado with what they will need during their stay packed in the top of their suitcases or backpacks, and at our offices we will give them ample time to transfer these essentials to the duffle bags provided. It is a good idea to bring waterproof casings for all your photography equipment. Protect your cameras, binoculars, documents and any other valuables that could be damaged by moisture in any form. 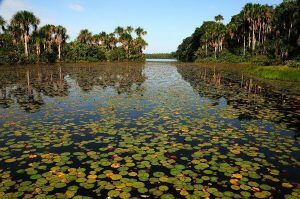 You will be visiting a rainforest; we will cross lakes, walk on muddy trails, embark and disembark from boats, and so there is a constant threat of moisture/water damage to gear. Wrap items in plastic bags and only take them out when you are actually going to be using them. A slip, trip, or splash by you or a companion could do damage you’ll regret for the rest of your vacation. When you arrive at the lodge your guide will inform you about what you should and should not do while you are at the lodge or in the forest. We suggest that you come with insect repellent and malaria prophylaxis. Yellow fever is present but uncommon. If you have a vaccination certificate bring it with you. None are mandatory for entering Peru, but several are recommended. For general travel, typhoid, infectious hepatitis, and polio are commonly advised. Consult your physician or local traveler’s clinic. While yellow fever vaccination is not officially required for travel to Peru, the disease is known to be present in the rainforest, and vaccinations are recommended for those traveling to all South American, Central American and Caribbean tropical forest destinations. Those seeking vaccination before travel should remember that they must receive their shot at least 10 days before arrival in the rainforest. Those already vaccinated should remember they will require a “booster” vaccination every ten years. Please use footwear at all times when walking around the lodge complex. FIRE! On every cabin balcony you will find a fire-extinguisher. Remember that we are far from the nearest town and emergency services, so please be especially vigilant. Water comes from a holding tank behind the Ecolodge and is precious. Any leaks should be reported to the administration, for immediate repair. The water used at the lodge is pumped from Gallocunca stream into a 20 cubic meter tank, where it is allowed to settle to remove any sediment. Once chlorine has been added to this water, it is supplied under its own pressure to the Ecolodge’s rooms, for use in showers and washbasins. In the kitchen, part of this water is stored in a one cubic meter tank, where it is purified and filtered before being transferred to an upper tank. It is this water which is used for cooking. In addition, part of this water undergoes an ozone purification process before being used to prepare soft drinks and fill the water cooler in the dining room, as well as to fill the pitchers placed on the night tables in guest rooms. This water can be used for drinking and for brushing teeth. Water straight from the faucet should only be used for washing and showering. Bottled water is also available for purchase from the bar, in 620 ml and 2.5 liter bottles. The 06 Suite rooms at the Ecolodge have a 220 volt (7 amps) power supply, although this is only available until 10:00 pm. However, the Lodge also has a 12 volt supply in those same rooms, supplied by solar panels. 1. From 10:00 to 13:00 hours in: Administration, kitchen, dining room, bar (this supply can be extended to the Suites if necessary). 2. From 17:00 to 22:00 hours in all areas of the Ecolodge, including the 06 Suite rooms. There is no electricity supply in the Superior rooms. The Ecolodge’s 12 volt supply is generated by solar panels and is available 24 hours a day in its Suite rooms, although consumption should be limited as much as possible. A multitude of rodent species live within the forest. Many are attracted to the smell of food. To avoid any unwanted visitors store any food you may have in the safety deposit box in your bungalow. Clothes should not be left to dry outside overnight. Botflies, the larvae of which are parasitic, tend to lay their eggs in wet clothing, after which the eggs hatch on contact with warm skin. All clothing should be hung up inside your room at night. Do not walk in the forest alone, and do not stray from marked trails. It is easy to get lost! When on trails we recommend that you cover up fully (long-pants and long-sleeves), use insect repellent and tuck pants into socks. When walking, keep an eye on the ground ahead of you for snakes and swarms of army ants. If a snake is spotted, do not approach it, inform your guide. The vast majority of snakes are harmless, although species identification can be difficult, so it is better to be safe than sorry! On no account must snakes be molested. If confronted by a swarm of ants, step across them carefully and then check footwear and socks thoroughly before continuing. The Ecolodge welcomes children and infants accompanied by a parent or legal guardian. Children under two years of age are welcomed free of charge, when sharing a bed with their parents or guardians. Children between 2 and 12 years of age are subject to a payment of 50% of the cost of their program, and at this rate they will be accommodated in an additional bed in their parents’ or guardians’ room. Tips may be offered to the guides or staff at the lodge, at your own discretion.